This is the very first entry of Nyx Mystery, rookie Fanfiction writer, newbie blogger and diehard Winx Club fan. Though nobody is going to read it, she deemed it appropriate to write an introduction anyway. 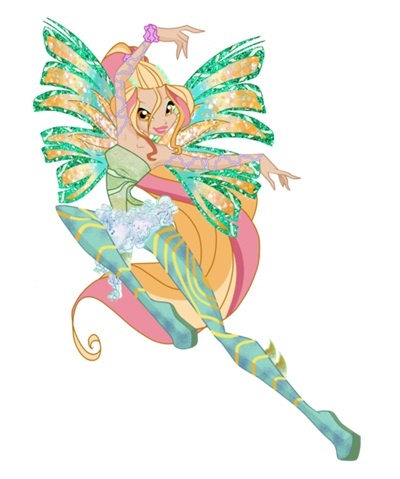 Please read this episode review of Winx Club Season Six Episode 1: Inspiration of Sirenix. Enjoy! This episode revolved around Daphne and her attempt to regain her powers. As well as having to deal with being corporeal again, our nymph confides to Bloom that she may have lost her powers. The Trix gate crash a welcoming party meant for Daphne with their pet Beast of the Depths, which cannot be defeated, only controlled by the Nymph of Domino aka Daphne. So, the Winx are forced to travel all the way to Lake Roccaluce all in the name of finding a remedy for power loss. Turns out that when the Sirenix guardians said Inspiration of Sirenix, they weren’t kidding. The Winx really do have to inspire Daphne, and, ta-na! It works! She sends the Devourer home and the Trix retreat to scheme another day. Though, I’m not a big fan of corporeal Daphne, got to admit she has the best Sirenix yet. Love the big hair. Another good thing is that we’ll probably never see it in CG. I don’t know about you , but to me, that deserves a party. Aesthetically, this episode is okay. The marionette effect is improving and the characters are moving much smoothly now. The OP is great, the best out of all the Winx openings, I would say. What I looked like after watching this episode. Then, that’s where all the good points end. Plot-wise, Inspiration of Sirenix probably has some of the most horrendously executed scenes ever. There’s a part in the series at which the writers attempt at some humor by having Daphne pawn all the Specialists by tripping them up, rolling their cape over…blah blah blah. The whole scene made me roll my eyes at how obscene it was. It seemed unrealistic and dumb. The execution wasn’t helped by the fact that the writing sucked balls too. Daphne didn’t need to lose her powers. And having the girls leave the castle in the middle of a serious dilemma to fly all the way to Lake Roccaluce to find something that was just plain sentimental mush could easily have been the stupidest thing any Winx writer had come up with. By leaving the castle, the girls were potentially endangering everyone there. I’m surprised none of the guests in-show actually disapproved of the girls’ idea. And the cheesiness! What’s up with all the cheesy dialogue?! “Oh man”, “Yikes”, “Yum”, “Let’s Jam”… I’m sorry, Rainbow, but the last time I checked, these girls were in their effing 20s! They’re adults! Make them speak like adults then! At least, Daphne had some sensible lines in the episode.